Luxury Mincemeat is an essential part of Christmas for me. 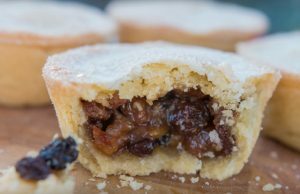 Homemade mincemeat to make Delicious Mince Pies marks the beginning of the festive season. 2 Granny smith apples, cored and diced with skin on. 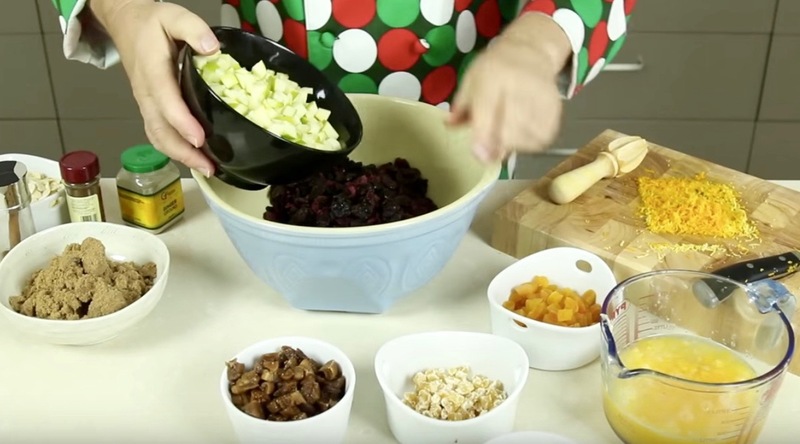 Into a large bowl pour the dried cherries, sultanas, currents and cranberries. Chop into small pieces the dried figs, apricots, ginger and apples. Add to the bowl with along with the almonds, suet and sugar. Add the zest and juice of the oranges and lemons. Now add all the spices. Start to stir and mix throughly with a wooden spoon. If the bowl is too full don’t be afraid to get your hands in there and give everything a thorough mix. Now it is best to leave the bowl covered on the side for 3-4 hours to allow the fruit to absorb all the flavours and juices. Once the fruit has all nicely plumped up, preheat the oven. Pour the fruit mix into a large baking tray and cover with aluminium foil. Place in the oven for 2 hours. Remove from the oven and give the fruit a good stir through. If you want to add brandy now is the time and again stir through. Whilst the fruit is still hot decant into sterilised jars or kilner pots and close the lid. Your luxury mincemeat is now ready to enjoy. Don’t forget to check out my channel for the many different mince pies that I have made.